You�re working temporarily at an off-site location and need ID badges for vendors or employees. You�re putting on a trade show and need name badges for participants. You�ve scheduled a demonstration at a remote facility and need to print temporary access cards for participants. You have several locations that need ID badges infrequently. While you can transport most ID card printers to a different location, the compact ID card printers are designed to be portable, like the Fargo DTC4250e, Zebra ZXP Series, Datacard SD Series, or the Magicard Pronto. Here�s how to safely and easily transport everything you need to print professional ID badges or cards. Depending on how you�re traveling with your ID card printer, you may need either a hard-sided or soft-sided case to protect your printer. If you�re flying to your destination and need to check your ID card printer with your luggage, a hard-sided case offers the most protection from the rigors of flight. Not only will it protect your ID card printer from the elements that could cause damage, a hard-sided carrier provides the extra structure and cushioning needed to safely transport your printer through the air. You can find hard-sided ID card printer carrying cases that come with wheels and a telescoping handle to make it easy to navigate the airport terminal, especially when you have other luggage to manage. 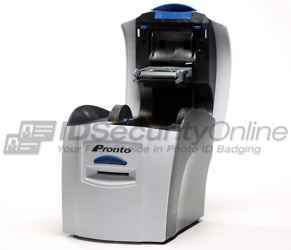 Most come with foam inserts to help protect your ID card printer from bumps and jostles during transport. If, on the other hand, you�re traveling by car a short distance to a remote location, a soft-sided carrying case can be sufficient protection. While they don�t offer as much protection for your printer as a hard-back case would, when you may have more control over how its being transported, you can make sure your printer is treated with the care it deserves. You�ll need ID software to produce your badges or cards offsite, and installing it on a laptop makes your system portable to be used anywhere. Where things might become complex is if you need access to a database to be able to issue ID cards. If you have your database stored on a server that you can access from remote locations, this is easily accommodated. If this is the case, you may need to consider a software license that offers more than one workstation. One such software solution to look at is the Asure ID Enterprise. Remember to pack all of the cables you�ll need to connect your laptop to your ID card printer and any cables needed to connect to your network if you need to access a database. Most of the carrying cases have pockets to stash your cables securely and safely. Don�t forget to pack extra supplies you�ll need like ribbons, cards, and your digital camera if you use one. Most carrying cases also have pockets for these types of supplies, but you may need a separate transport system for your digital camera. Consider what is the safest, most effective way to transport a digital camera. IDSecurityOnline�s experts are well-versed in how to safely and securely transport everything you need to print ID cards and badges while on the go. Call an IDSecurityOnline professional today to discuss your needs. We�ll be happy to help you find the right solution.